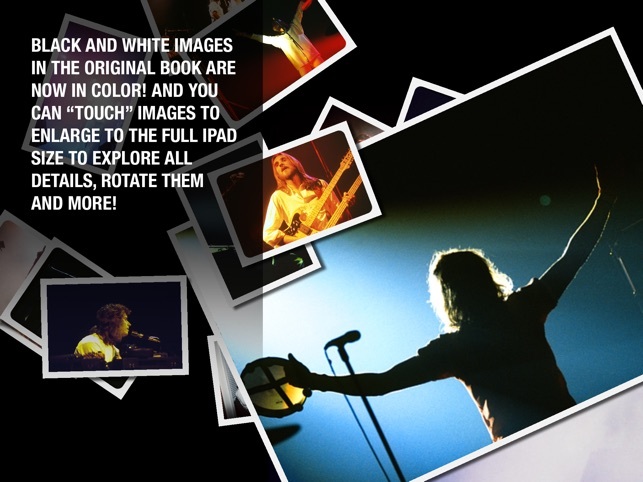 Armando Gallo, Genesis’ Photographer and Biographer, turns his Classic “I Know What I Like” book into an amazing, comprehensive and highly interactive app with exclusive photos and music. Since 1970 Armando Gallo started to follow the career of a then very little known British band called Genesis. They would eventually grow to be one of the most influential groups in rock history… but who knew? He didn’t either, but apparently something captivated him strongly enough that made him follow them around the world in the 70s documenting their every move. The result was 10 years of stories plus stage and behind the scenes photographs of Genesis starting with the Peter Gabriel days and beyond. 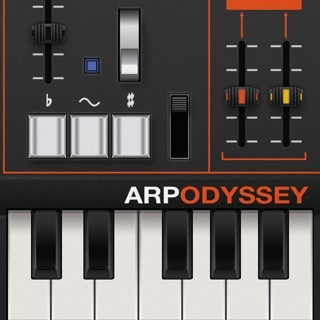 Armando did extensive research interviewing the band members, their families, friends, managers, school teachers, agents and producers, and dozens of hours of tapes where revisited for the making of this app that includes classic sound bytes. 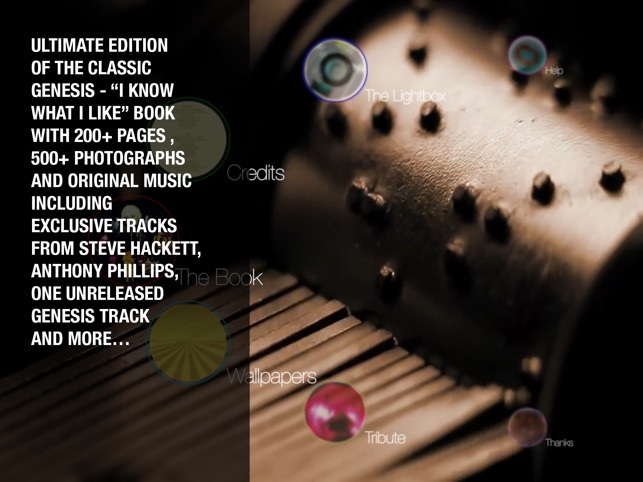 ● Deluxe Edition of the Classic “I Know What I Like” book with over 200 pages and over 500 photographs. 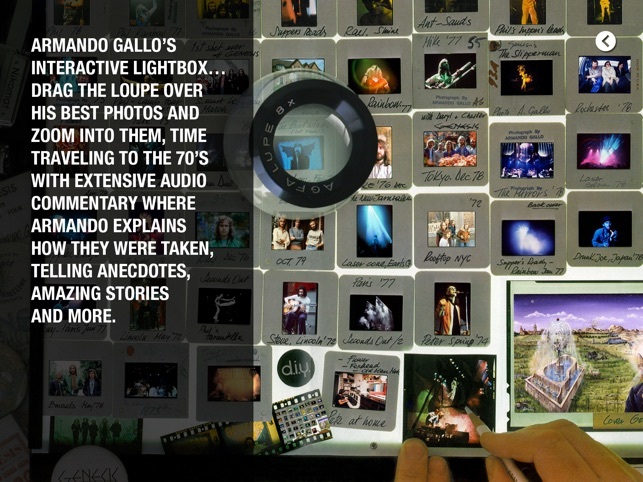 ● Armando Gallo’s Interactive Lightbox… Drag the loupe over his most precious photographs and zoom into them, time traveling to the 70’s with extensive audio commentary where Armando explains how they were taken, telling anecdotes, amazing stories and more. ● Never before heard, unreleased early Genesis music and exclusive Photos. ● Videos with Paul Whitehead, the artist who created the art for Trespass, Nursery Cryme and Foxtrot, explaining his creative process and collaboration with the band. ● Exclusive Animations and Sequences. ● Black and White images in the original book are now in Color! 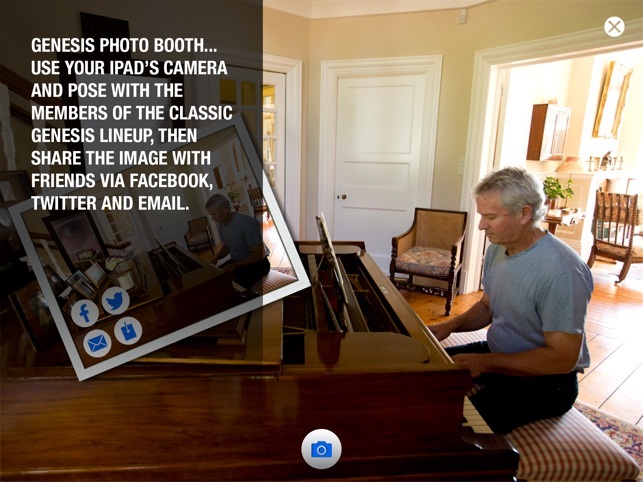 And you can “touch” images to enlarge to the full iPad size to explore all details, rotate them and more! 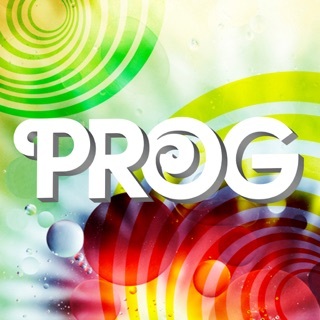 ● Genesis Photo Booth... use your iPad’s camera and pose with the members of the Classic Genesis lineup, then share the image with friends via Facebook, Twitter and Email. 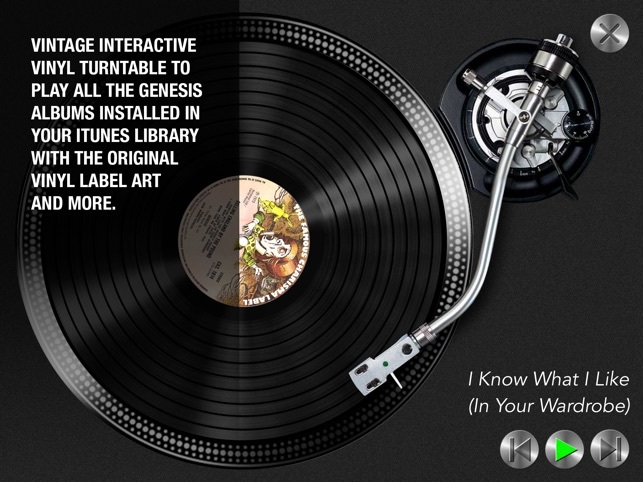 ● Vintage interactive vinyl turntable to play all the Genesis albums installed in your iTunes library with the original vinyl label art and more. ● Share Genesis Postcards with friends via Facebook, Twitter and Email.